An article describing a two-stage injection technique was published in the current issue of Anesthesia Progress. The new technique was found to significantly lower both observed and reported pain levels in children when compared to conventional methods. They found that by placing a gel anesthetic in the gum area, depositing a small amount of injectable anesthetic, and then waiting 5 minutes, the full injection was far less painful. Anesthesia Progress – Many people are afraid of needles, but children are especially fearful. As a result, dentists are continually looking for ways to make injections less painful and therefore less frightening. Thankfully, new research provides evidence of a promising technique. The article describing this technique was published in the current issue of the journal Anesthesia Progress. The authors intentionally focused on children when they sought a way to reduce pain associated with local anesthetic injections during dental work. They tested a two-stage injection technique designed to cause less pain. Dental disease is one of the most common chronic health problems among children, according to the Centers for Disease Control and Prevention. It accounts for many lost days at school, chronic mouth pain, and difficulty eating. However, putting a child in pain in a dentist’s chair and then approaching that child with a needle of anesthetic can lead to tears and tantrums. For these reasons, the authors of the current study felt that, when it comes to pain control, children should be the target group. Their study involved 100 children between 7 and 13 years of age who needed local anesthetic before dental treatment. Children received either a conventional injection or a two-stage injection at their first appointment. A week later, each child received the other injection on the opposite side of the mouth. The authors evaluated the pain experienced by each child each time an injection was given, using a pair of rating scales. They found that by placing a gel anesthetic in the gum area, depositing a small amount of injectable anesthetic, and then waiting 5 minutes, the full injection was far less painful. This two-stage technique resulted in significantly lower pain levels, both reported by the children and observed by the researchers, compared to the pain felt when the conventional technique was used. The authors concluded that the two-stage injection “is a simple and effective means of reducing injection pain in children.” This technique may improve children’s experience at the dentist and remove one of the barriers to effective dental care. Full text of the article “Evaluation of 2-Stage Injection Technique in Children,” Anesthesia Progress, Vol. 63, No. 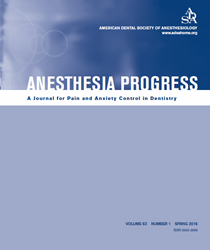 1, 2016, is now available at http://www.anesthesiaprogress.org/doi/full/10.2344/0003-3006-63.1.3.